In a previous post, we covered how to analyze, qualify and resource your content migration efforts, but when it comes to thinking about the actual migration of the content, there is a mythical fork in the road when choosing manual or automatic migration strategies. The truth is you should consider blending both approaches. Automatic migration saves time when content is either highly structured, there’s a high volume of it, or if you’re doing a one-to-one mapping to the new system. Manual migration should be considered when content is divided across multiple locations or if heavy editing is required. This involves auditing your content to create a content inventory, then evaluating the quality of each piece of content based on the measures you’ve determined in your strategy. Current resources: What resources do you have to manually migrate content? Do you have development resources who could code a migration script? 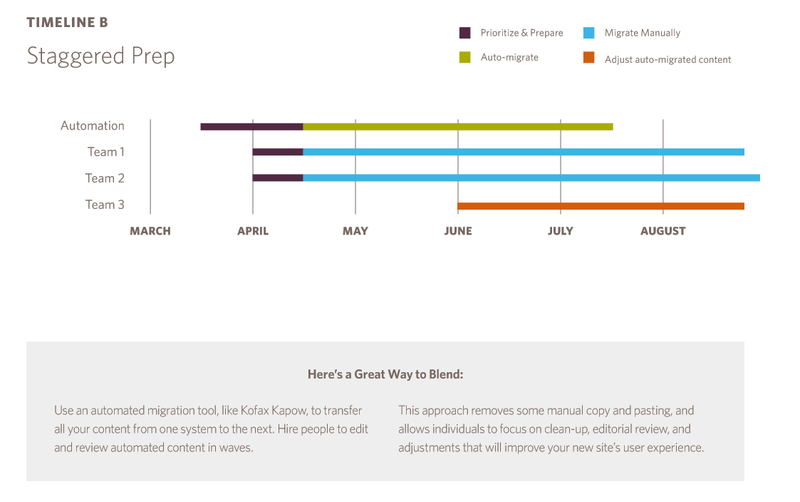 Amount of content: How much content do you need to migrate before your launch date? Type of content: How consistently structured is your content? Is each page unique or do patterns exist? Content editing: How much editing will be required to the content? Are you planning on changing how content is presented? Launch requirements: What’s your comfort level with launching content that hasn’t been reviewed by a human? Are you aiming for a minimum viable product (MVP) at launch? So don’t let the myth that you must pick either an automatic or a manual migration fool you. 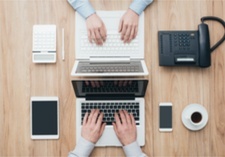 There are many ways to blend both tactics when moving your content from one CMS platform to another. Refer to the charts below for some sample migration plans, and download our Content Migration Guide for more information.